The Canadian Alliance to End Homelessness has been formed to build a national movement to end homelessness from the community up. We believe we can end homelessness in Canada. We believe we can do it one person, village, town, city and province at a time. What’s needed is a Plan. There are plenty of people at the local level across Canada who have the knowledge and the expertise to get the job done. Everything you need to know to end homelessness is known in your communities or is available from others. There are many effective partnerships at the community level that engage government, non-profit agencies and private sector groups in innovative initiatives. And the financial resources exist. What’s missing is a practical, community-based approach that shifts the focus from managing homelessness to a system focused on ending it. We need to move from crisis responses (like shelters and soup kitchens) to solutions – permanent, appropriate, safe and affordable housing with the support necessary to sustain it. 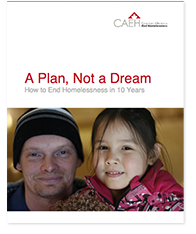 A Plan, Not a Dream: How to End Homelessness in 10 Years spells out how Canadian communities can end homelessness in 10 years or less by outlining the critical ingredients of a community-based 10 Year Plan to End Homelessness.